As caveat: I've provided more ways use this book than I think you should actually try to cram into one session! It would work better over a series of a couple days. Even if you have longer session lengths, I think more repetition is always better than overwhelming the students. Create an "Idiom Wall" to add to as you read the book (and throughout the year!). Put it on a poster board or use masking tape to make a quick chart with three columns and the headings: Idiom, Literal Meaning (picture), What It Really Means (used in a “showing sentence”). "No? Then what does “butterflies in my stomach” really mean?" A common phrase that means something different than what it says. "Who can tell me an idiom they have heard before?" 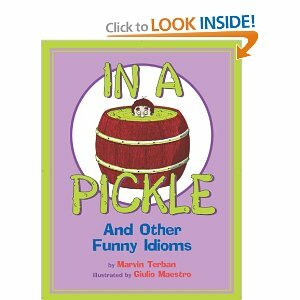 Read: In a Pickle: And Other Funny Idioms. After reading each page, ask the students, “What does this really mean?” Prompt them to think of when they could use that phrase, and assist them in creating “showing sentences” to elucidate the meaning. Assign each student one idiom to add to the wall after reading In a Pickle: And Other Funny Idioms. Pull up the ReadWriteThink webpage and introduce students to the interactive idiom resource. In this activity, students will complete the sentence by choosing the proper idiom from a drop down list, write the metaphorical meaning of the idiom, and provide another sentence using the expression. Find my homework sheet here - instructions for use are in the Set-up section at the top of this page. The first idiom is completed for the students. I recommend completing another example as a group, then assigning the additional three for homework. You could assign the students different idioms or leave the space blank for them to come up with their own at home. Provide this resource if you want the students to find their own idioms. Guide students through this website, highlighting a few of the idioms. The format of the presentation of idioms reflects what the students will need to do for their homework activity: create a drawing that reflects the literal meaning, and a “showing sentence” that define the expression by using context. All of the illustrations are student-created. Incentivize the students to bring back their homework by letting them know that their work will be added to the “Idiom Wall” for everyone to see! (To display, copy each side of the completed homework and cut components apart to put on the wall). To extend the lesson, use the completed homework pages as a starting point in your next session. Refer to this site for a nice lesson that also uses In a Pickle: And Other Funny Idioms, and includes additional lessons for similes and metaphors.